With a view of fire protection & a practical alternative to traditional hinged doors, we provide Fire Rated Sliding Doors for limited space or for maximum opening sizes for the movement of people and material through the building. With a fire withstanding capacity of 2 hrs & 4 hrs, they are available in automatic closing mode. Available in single or bi-parting type design Fire rated sliding doors are top hung and suitable for lower lintel areas. 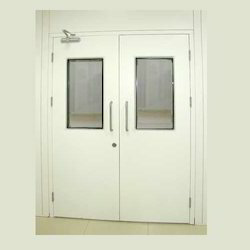 Fire resistant sliding doors are designed to combine neat appearance with excellent fire protection features. Our ranges of doors are available with fire retardant in filled material and are designed for integrity and stability. These are structured and constructed to prevent the spread of fire to adjoining areas. A fusible link is integrated which melts at 68 C and ignites the fire doors to close automatically during fire breakouts. Surface Finish Powder coated with pre-treatment process. We are one of the leading manufacturer and supplier of Fire Rated Rolling Shutters. Fire rated rolling shutters acts as a barrier & prevents the fire spread in case of fire breakout from one area to other. EN/UL/FM Global certified shutters also available. All steel components of the fire rolling shutters are designed and fixed to provide complete sealing. Our ranges of Fire Resistant Doors are available with fire retardant in filled material and are designed for integrity and stability. We are engaged in offering Fireproof Doors. The fusible links present in the Fire rated sliding shutters melt at 68°CF, which triggers the fire sliding doors to close automatically in the event of a fire. Looking for Fire Rated Doors ?